The Biggest BPI AutoMadness Still on this October! 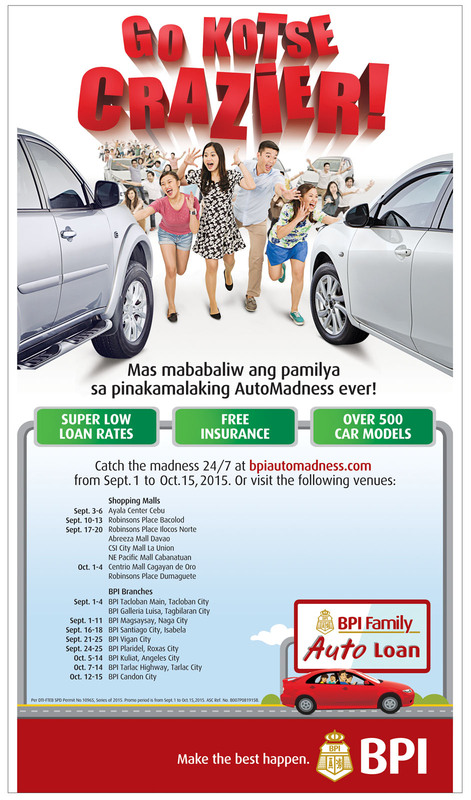 The much awaited car sale from BPI Family Auto Loan is back with crazier offers and more venues than ever! The biggest of its kind yet as it runs online via bpiautomadness.com which started on September 1 spans to 8 shopping malls and 8 BPI branch venues in major cities across the country. It is also the longest running as the special car offers are made available for a month and a half. Car buyers will go crazy over the super low loan rates, free comprehensive insurance and over 500 car models offered during the BPI AutoMadness. “With the successful turn-out of our previous BPI AutoMadness events, we are committed to continuously come up with better offers to make car ownership more affordable and very convenient to every Filipino family. We want to make the best happen for Filipinos planning to buy their brand new car, may they be here or abroad,” says Pepe Carlos, VP and head of BPI Family Auto Loan Division. BPI AutoMadness happened in strategic locations around the country namely, Ayala Center in Cebu City from September 3 to 6; Robinsons Place in Bacolod from September 10 to 13; Robinsons Place in Ilocos, Abreeza Mall in Davao, CSI Mall in La Union and Pacific Mall in Cabanatuan City from September 17 to 20; Centrio Mall in Cagayan De Oro City; and Robinsons Place in Dumaguete from October 1 to 4. Furthermore, BPI Family Auto Loan also holds the BPI AutoMadness in select BPI branches to make the offers more available nationwide among which, at BPI Tacloban City and BPI Tagbilaran City from September 1 to 4; BPI Magsaysay-Naga City from September 1 to11, BPI Santiago-Isabela City from September 16 to 18; BPI Vigan from September 21 to 25; BPI Plaridel-Roxas City from September 24-25; BPI Kuliat-Angeles City from October 5 to 14; BPI Tarlac Highway-Tarlac City from October 7 to14; and BPI Candon City from October 12 to 15. For those outside of the country, BPI Auto Loan makes the BPI AutoMadness accessible to them 24/7 through the website www.bpiautomadness.com. All the participating car brands and special car offers can be accessed anytime and anywhere through any web-enabled smartphones, PC, tablets or laptop for truly convenient car shopping. For more information on the most affordable and convenient way to own a car, simply log-on to www.bpiautomadness.com.